While prepping some figures for my ongoing Adeptus Mechanicus project I decided to cast up a replacement head for one of the figures. Way back in the last century I made more silicon rubber moulds than I could count. 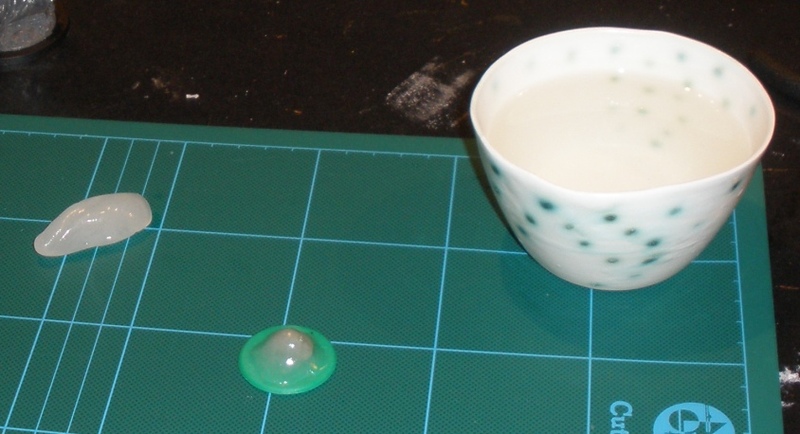 I also cast very many items in various resins in them, as it was a large part of my old job working in industrial prototyping. A lot of people seem to enjoy using those industrial substances at home in their workshops, sheds and hobby rooms and good luck to those people: I hope that they enjoy it. I on the other hand have no desire to invest time and money in such horrible, toxic and messy substances for use in my house. Therefore any casting that I do has to be clean, easy and effective. No vacuum pumps, no multi-part moulds, nothing very complex. 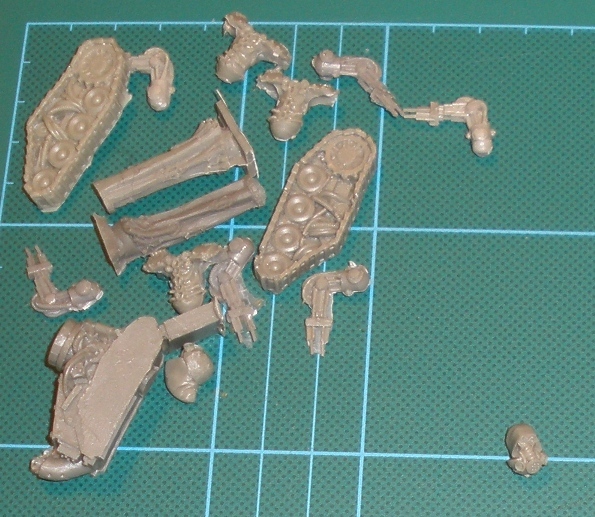 Push moulds and simple two part moulds for tiny items are the limit of my casting desires at the moment. So I got some “oyumaru” (also known as “Instant Mold”) and used it as outlined below. I used nothing but basic techniques and I wouldnt really describe it as a “how-to” or anything, but it might be of interest to someone. Firstly I selected the replacement part that I wanted to cast: its the hooded and masked head shown on the bottom right in the picture above. Next I cleaned up mould lines and all of that, filed the underneath of the neck flat and stuck this flat area to a flat piece of plastic (a tiddlywink). I attached the part to the tiddlywink as I wanted to make sure that I could get the mould rubber to cover the detail on the bottom of the part. I found it easiest to stick the part to something flat to so that I could work the oyumaru into it while still maintaining a flat base to the mould. I hoped that this would help to minimise distortion in the castings later while also making the part easier to handle. The oyumaru was submerged in the hot water for a minute or two at which point it became very pliant. I quickly covered the part in oyumaru. I ensured that I worked the material under the part and and against the flat plastic tiddlywink. I also tried to minimise possible air bubbles in the detailed face area by working the oyumaru gently into those details as carefully as I could. A few minutes later the oyumaru had cooled down and become rigid again. I prised the part from the tiddlywink. Then starting at the bottom where the part had been glued to the plastic I used a scalpel to cut through the side of the mould. I went about two thirds of the way around the mould, gently cutting to the part as I went. I didnt want to split the mould entirely in two as I didnt want the hassle of having to engineer some way of keying the two halves back together when casting. Keeping the mould attached would help to minimise that. Also of note is that I slit the mould from ear to ear across the top of the head, from the parts perspective. As the head is hooded I figured that those areas would be the easiest to clean flashing and mould lines from later. 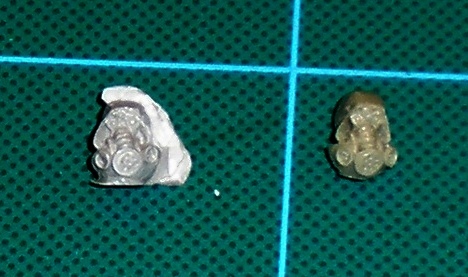 Obviously, splitting the mould through highly detailed or recessed areas would make cleaning up the subsequent castings far more difficult (as anyone reading who has ever had to clean a crappy mould line of the side of a miniatures head knows). I then mixed up some two part epoxy putty (I used ProCreate, which is essentially grey coloured “Green Stuff”) and pushed that into the mould. Like when making the mould itself, I was careful to make sure that as much of the detailed face area was filled as possible. 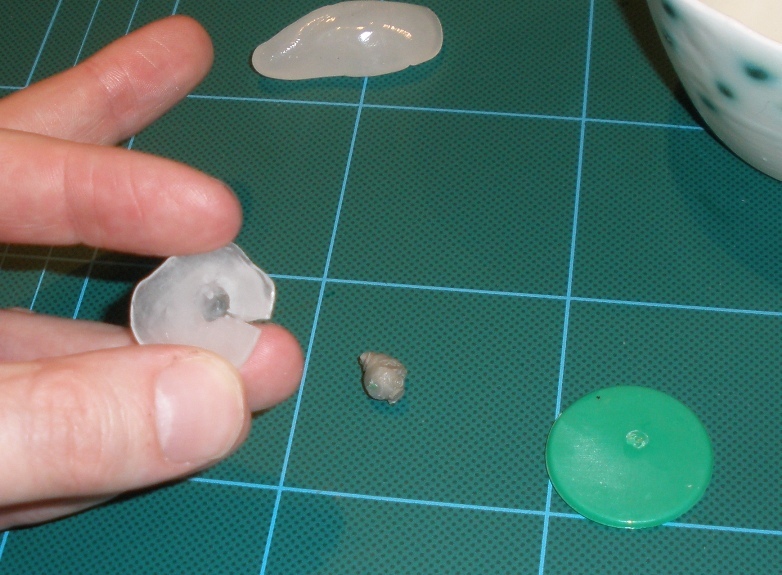 The part as it came out of the mould is on the left. Note the flashing from the cut side of the mould. Although it looks bad in the photo it really is only a fraction of a millimeter thick, so it took only a moment to remove. Above is a quick snap of the newly cast head in its new home. 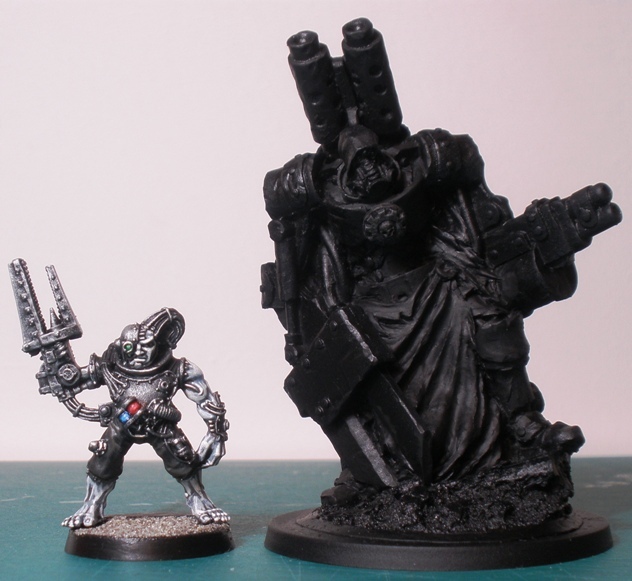 As you can see its a pretty huge figure (from Ramshackle Games) which is why I included the Servitor for comparison. 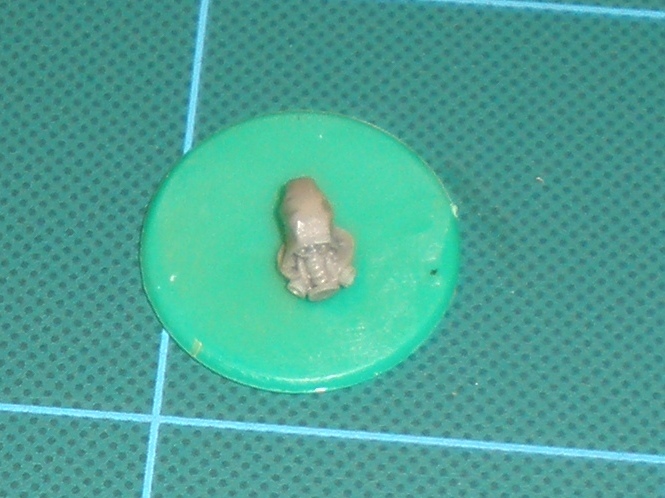 The size of the target figure isnt really releant anyway, the piece cast was a standard 28mm heroic scale head. Like that head, the Adeptus Mechanicus cog on the big models chest is also made of ProCreate via an Oyumaru push mould. That also came out pretty well. My verdict on this stuff is that its brilliant. 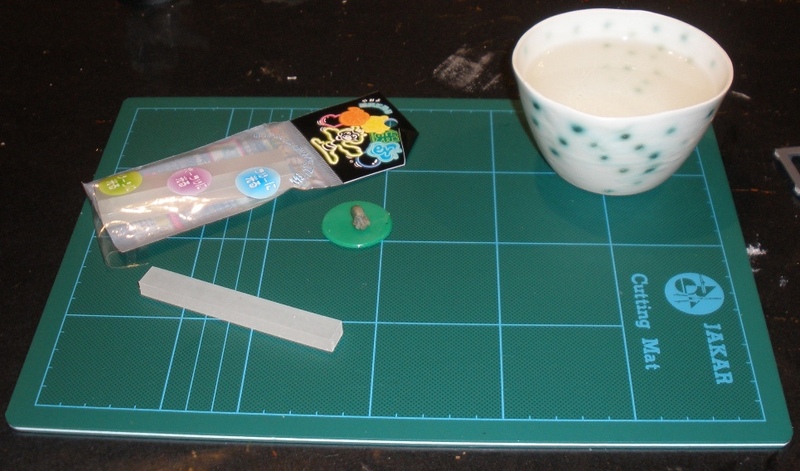 It provides a very simple, low outlay and non-toxic way to replicate miniature parts. I see this as being part of my hobby toolbox for good. 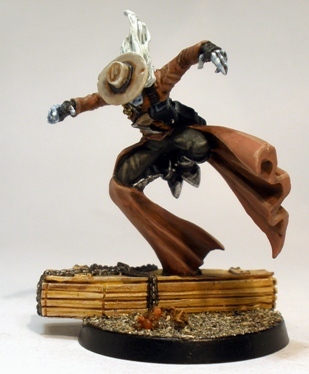 The very first Malifaux figure that I am posting up is this guy, Judge. Judge is a member of the Guild, who are the less than benevolent authoritarian figures in the setting. 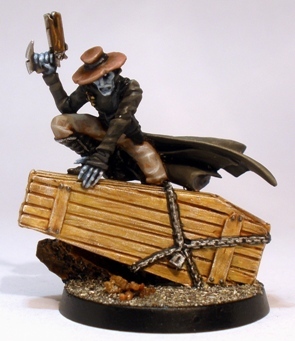 He hangs around with Lady Justice and the Death Marshals, who all specialise in taking out Resurrectionists (essentially Necromancers). As far as I am aware Judge has suffered some severe damage to the lower portion of his face, which is why he wears that bandana… I think. It doesnt matter anyway as it looks pretty cool I reckon. Judges Long Arm blade has a pistol built into the hilt, which in game terms allows him to do all sorts of Matrix-y combination gunfire and dismemberment moves in game. Check out the pistol hilt. Another figure from the Lady Justice box set goes up tomorrow. I have started yet another project. 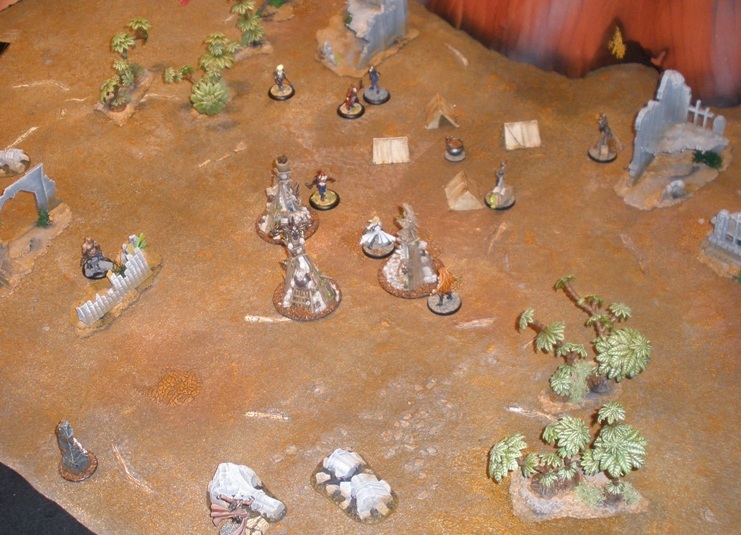 Its Malifaux this time. 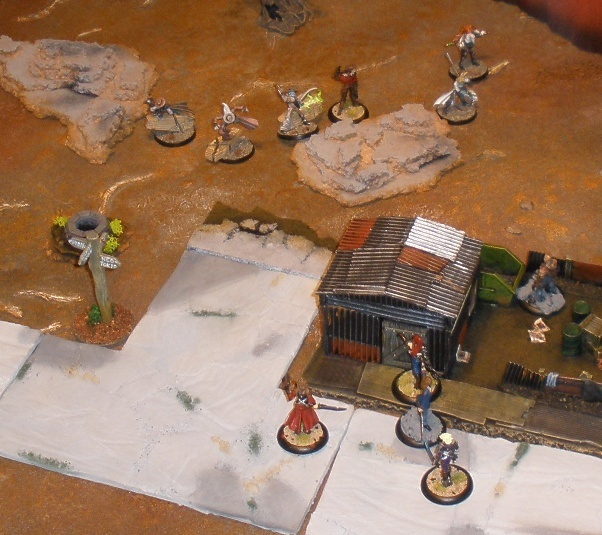 Malifaux is a skirmish miniatures game set in a steampunk Western dystopia with horror elements. 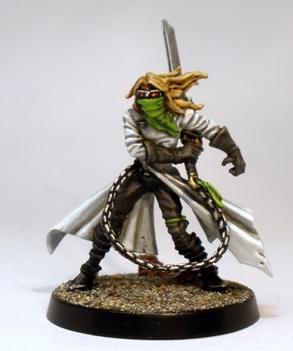 It appears to me that this odd mashup occurred because Wyrd Miniatures produced an eclectic range of figures before the game was even conceived and then decided to shoehorn the lot in to the game. Despite how dodgy this sounds, Wyrd did manage to create a game world that feels unique and pretty coherent. The fact that the majority of Wyrds miniature output is really very nice also helps. The first and most important reason is driven mainly by the fact that I have found a local miniature gaming opponent and he and I are trying to get a regular Mancave mandate going. 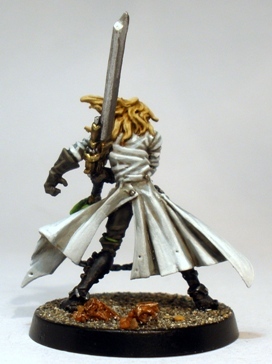 For this to work it will involve a little give and take regarding what games to play and paint miniatures for. 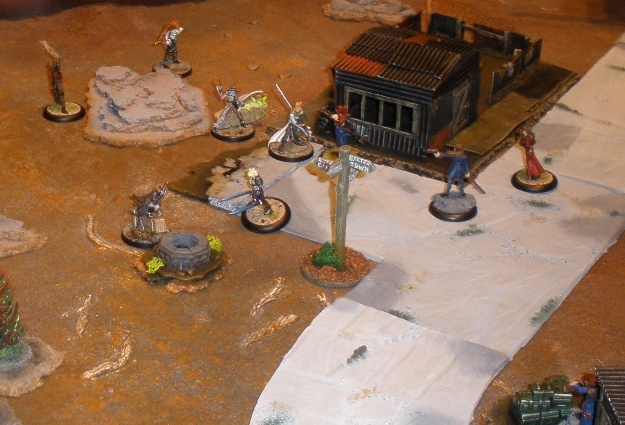 My opponent (hereby known as COM) has a number of Malifaux forces painted up, as well as all of the necessary rulebooks and the like. Therefore painting up 5-10 figures for the game is an easy buy-in for me. 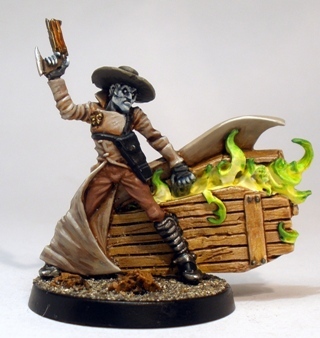 Secondly I already own a Malifaux starter box of five figures. 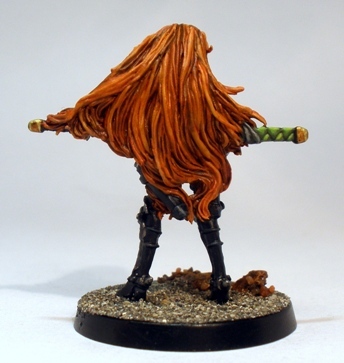 I bought them back in ’09 because I liked the look of them and without any plans to play Malifaux. Because of their cowboy aesthetic I had planned to use them in post-apocalyptic games. I had not got any further than priming the figures so this gave me an opportunity to return to an old project and get some closure. 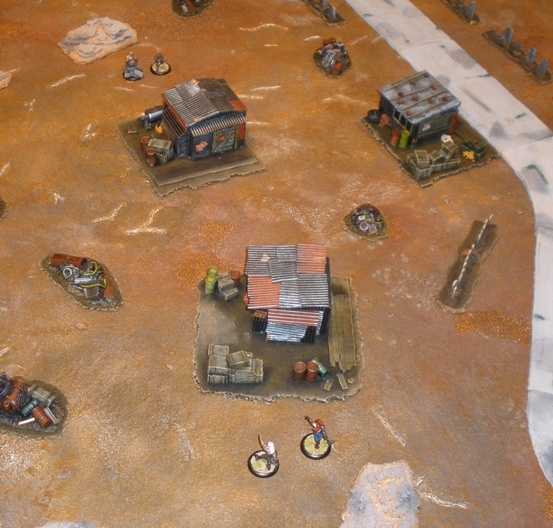 Thirdly my post apocalyptic terrain, in particular the Standard Falls stuff is well suited to the setting. It is visible in some of the photos of games shown in this post. It lacks some of the more steampunk elements from the Malifaux setting but a few features that resonate with Victorian sci-fi are easy to add at a later date. Lastly, it is a very small project and quite easy to achieve. At the time of writing I have five figures painted with work beginning on others. Those five figures from my Lady Justice/Death Marshals set will be going up daily here, starting in a minute and continuing daily until Sunday.